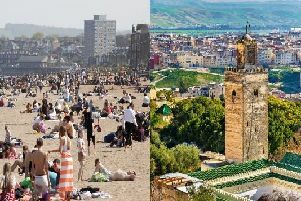 Edinburgh’s early summer heatwave is set to continue throughout the week with temperatures rivalling those in Portugal, Tanzania and Turkey. Forecasts indicate the Capital could push up to 28C today – hotter than expected in Lisbon, Dar Es Salaam and Istanbul. The whole country has basked in the sun all week and the blazing heat looks set to continue with the Met Office saying temperatures could even hit 30C in Edinburgh tomorrow. A Met Office spokesman said: “The temperatures for the rest of the week are expected to be warm and it will remain fine and dry across the whole of Scotland. STV forecaster Sean Batty said it was Scotland’s warmest day in five years yesterday as Aviemore hit 30.7C. He said it was also the warmest June day for more than 20 years and Aviemore’s second warmest day on record. And the Cairngorm summit reached an astonishingly high 20C – the highest June temperature seen there since records began 16 years ago. But it’s not all been good news with rail services affected in some areas after tracks buckled in the heat. Network Rail said that, with more summer weather settling in over the country, special measures will be put in place to help ensure the railway keeps moving. Rails in direct sunshine can be 20C hotter than air temperature and steel rails expand as they get hotter, and can start to curve – or “buckle”. Warnings have been issued about the impact and dangers of the warmer weather. Care UK’s Lauder Lodge on Wakefield Avenue and Cairdean House on Redford Road are asking people to remember that not everyone enjoys the higher temperatures. “For some older people the heat can be dangerous, triggering breathing problems, heat exhaustion and dehydration. The Met Office said that those headed out in the sun should ensure they stay hydrated, use sunscreen and wear a hat. Despite a scorching sun Ladbrokes has cut odds from 3/1 to 5/4 for Scotland to break its overall 32.9C temperature record, set on August 9, 2003, at Greycrook in the Borders. And for some, the increased temperatures have triggered the arrival of some unwelcome guests. Portobello pest firm Wee Critters, who assist with everything from rodents to seagulls, has seen a huge surge in calls. Owner Sylvia Hill says that she has received around 100 calls a day this week, as people have begun to notice more bees in their gardens. “Every time I put the phone down it rings again. Ms Hill says callers can be “very demanding” and want the bees to be removed. However, due to worryingly low levels of bees worldwide, no pest control company will kill bees – and very few will remove them, including Wee Critters.